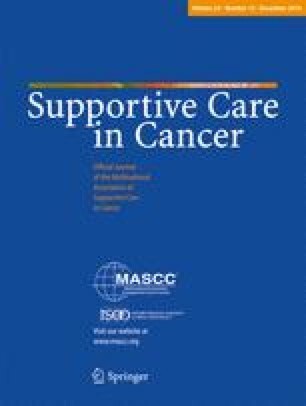 The purpose of this study was to identify the treatment-associated problems that most impact on patients undergoing cancer chemotherapy, how problems relate to experiences of supportive care and variations in experience between cancer treatment centres. A survey administered to patients at six cancer centres in England explored variations of prevalence of 17 cancer chemotherapy-associated problems and associated supportive care. Problem items were identified as the most frequently experienced and severe when experienced in a scoping and consensus exercise. A health-related quality of life (HRQoL) measure, the EQ5D, was included to measure impact of problems. A total of 363 completed questionnaires were returned (response rate 43 %, median 61 %). The most prevalent problem was ‘tiredness/fatigued’ (90 %), followed by ‘changes in taste & smell’ (69 %) and ‘difficulty managing everyday tasks’ (61 %). Significant variations in problem prevalence existed between centres, and some common problems were rarely reported in the literature. Regression analysis found that almost all problems were significantly associated with HRQoL, with social/emotional problems having as much impact on HRQoL as physical/psychological side effects of treatment. Greatest effect size was for difficulty managing everyday tasks. Respondents reported significant variations in supportive care between centres, with more supportive care received for physical/psychological problems than for social/emotional problems. Findings indicated that patients who received increased supportive care experienced less severe problems. The most common and distressing chemotherapy-associated problems were identified. These problems are mitigated by quality supportive care. Routine measurement and monitoring of problem items and supportive care are warranted to facilitate benchmarking and service improvements both within and between cancer centres. The study was funded by the National Cancer Action Team (NCAT). We would like to thank all the patients and staff at each of the six cancer centres who participated and made this project possible. In particular, we would like to thank the staff members who coordinated the distribution and collection of the pilot survey questionnaires: Michael Flynn, Bernie Wilson, Jeanette Ribton, Belinda Mills and Amanda Tonge. We would also like to thank Geoff Pike of Employment Research Ltd. for assisting with analysis. The authors have no conflicts of interest to declare. All data remains the property of the authors, and results were not subject to approval by any funding body. Systematic Anti-Cancer Therapy Chemotherapy Dataset 2015 http://www.chemodataset.nhs.uk/home (accessed 20/10/2015). Quality Health (2014). Cancer Patient Experience Survey 2012–13: National Report. https://www.quality-health.co.uk/resources/surveys/national-cancer-experience-survey/2013-national-cancer-patient-exerience-survey/2014-national-cancer-patient-experience-survey-reports (Accessed 26/06/2015). Department of Health, Macmillan Cancer Support, NHS Improvement. The National Cancer Survivorship Initiative Vision. Department of Health, 2010. http://www.dh.gov.uk/en/Publicationsandstatistics/Publications/PublicationsPolicyAndGuidance/DH_111230 (accessed 20 Sept 2015). NHS England (2014) GP Patient Survey http://www.england.nhs.uk/statistics/2015/01/08/gp-patient-survey-2014/ (accessed May 25 2015).